16 interactive screens used to produce experiential zones exemplifying Dell’s case studies targeting a C-suit customer base. with only a 1 hour set up. Capture the essence of Dell's Future Ready business solutions. We were tasked with creating a large scale C-suite networking event, to bring their customers up to speed with all Dell has to offer in the new technology focussed business age; visualising how Dell are empowering businesses across the world to gain serious competitive advantage. We brought Dell's Future Ready messaging to life by transforming a breathtaking historic building and creating an experiential portal demonstrating Dell's four key Future Ready pillars and Internet of Things. Each interactive zone was supported by customer case studies from Tesco, Sky, The University of Cambridge and more. The Natural History Museum was transformed in under and hour, taking it from prehistoric to /Future Ready/. We brought in 16 interactive screens to create experiential zones that would fully immerse customers in the messaging, bringing it to life for them in a brand new format. On top of the networking set-up with champagne and canapés, we brought in the founder himself. 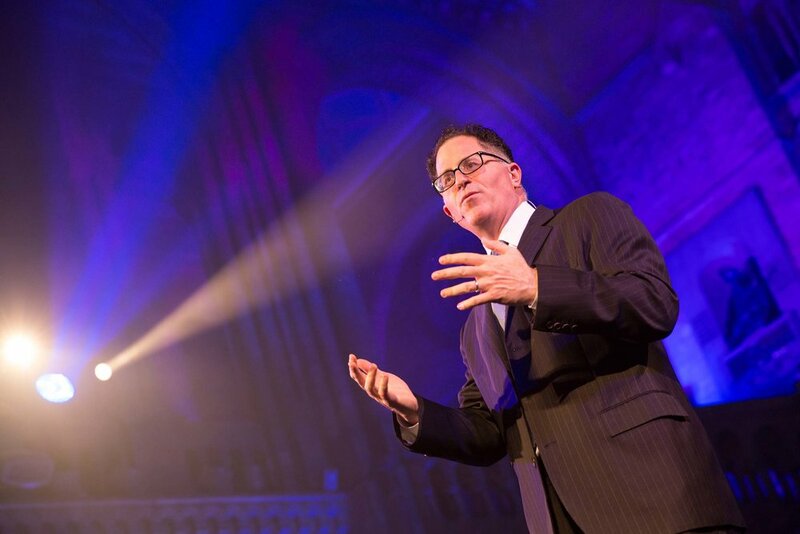 Michael Dell was on hand to create an amazing VIP experience for Dell’s customers. They were able to hear the capabilities first hand as well as have their burning questions answered.